In contrast to the prosaic nature of the cafeterias in my main article this month, Cafeteria 15L is an attempt to bring some glamour to the genre in the space formerly occupied by the late, slighty lamented Masons. Except… it’s not a cafeteria. There are no trays, steam or otherwise, just normal table service in a warmly lit restaurant with slightly kitschy mid-century modern accents. The menu screams upscale comfort food, which is not exactly a recession-proof concept. But then again, what is? On a list brimming with sugary cocktails, I asked our delightful server for the least syrupy one and she recommended the “loose juice,” a blend of gin and elderflower liqueur, muddled with cucumber and lime. It was refreshing but not very interesting – kind of like a mildly alcoholic lime-ade – and certainly not worth ten dollars. The beer list is packed with dreadful commercial stuff that isn’t even refreshing, so I left it at one cocktail. I chose the hangtown fry from the whimsical appetizer selection and it was delicious and well-executed, all whimsy aside. (And cute as the dickens, served in a tiny cast-iron frypan.) 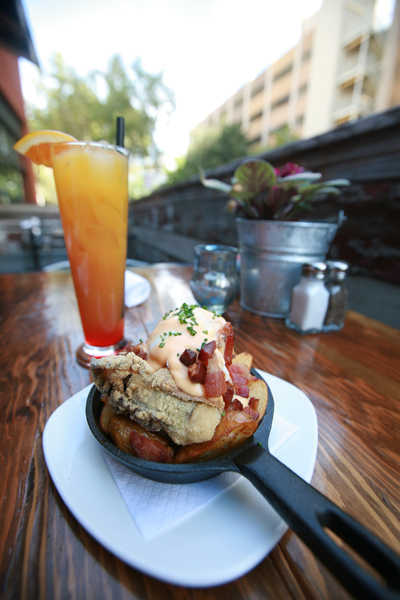 The two deep-fried oysters were crunchy and plump, and the tiny squares of bacon strewn throughout were deeply smoky. I savored each bite of fingerling potato soaked with hollandaise sauce and yolk from the poached egg on the top.